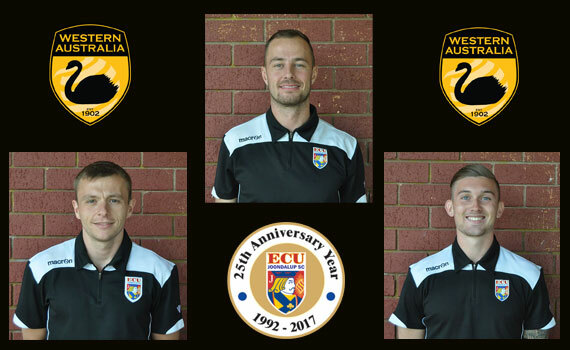 ECU Joondalup trio Gordon Smith, Ross Millard and Daryl Smith all played their part in a good Tri-Series competition for the WA State Side, in games against the Young Socceroos and the Singapore Youth side over the last week. Nicol said they took the game to both the Young Socceroos and Singapore. “I thought the squad we had was very strong and even in the first game against the young Socceroos we were very competitive,” he explained. Millard said it was a great occasion and he really enjoyed it. “It was a great experience to play against both Australia and Singapore. Both sides provided big tests for us but ones that we really enjoyed. Both sides were well drilled so it shows the quality we have in the NPLWA due to how competitive we were,” he said. The young defender said the WA side showed they can take on anyone and push them, and their performance was even better with limited time to prepare. . “We only had three training sessions prior to the two games, which wasn’t ideal, so to come out and play together like we did was a great testament to all the lads,” he said. Well done to the trio – They were all outstanding and played their parts in both games and represented ECU Joondalup and West Australia with pride.